Can a Better Electric Motor Save the Planet? If Nikola Tesla, the legendary genius who invented the electric induction motor were alive today, he would no doubt be disappointed. That’s because the majority of electric motors we produce today (including the one that powers his namesake 2017 Tesla Model S), remain fundamentally the same as the one he patented in 1887. So much for progress. For those of us alive today, that’s not a good thing. Here’s why: half of all the electricity in the world is consumed by electric motors. Combined, these motors consume about 9,000 trillion watt hours (terawatts) of energy each year. 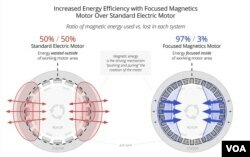 Improving the energy efficiency of the world’s electric motors by just one tenth would save enough electricity to run the entire country of Japan for an entire year, dramatically reducing the world’s carbon footprint and cutting harmful CO2 emissions by nearly a billion tons. Now imagine if the technology to make electric motors nearly twice as efficient were already here. Robert Catalan, founder and CEO of Focused Magnetics says it is. Wearing an impish smile that never seems to leave his face, Catalan looks more Buddhist monk than genius. But it is the belief for what his new invention can accomplish where this mild mannered engineer’s true motivation shines. Turns out, deep down, he just wants to save the planet. “Electric motors have two basic elements. One is the part that rotates (the ‘rotor’) and the other is the part that doesn’t move (the ‘stator’). But it’s really the space between the rotor and the stator (i.e. the air-gap) where the work of an electric motor takes place.” Because conventional electric motors use magnets and electromagnets with equal polarity (i.e. 50% north pole and 50% south pole), Catalan says half of the magnetic energy is always directed away from the air-gap, leading to poor utilization of available energy. Catalan’s quest to utilize available energy efficiently led him to investigate the work of Berkeley physicist Klaus Halbach. In 1987, Halbach discovered that by orienting permanent magnets a certain way, he could focus nearly all of the magnetic field to one side. In doing so, Halbach had discovered a way to create ‘near-monopole’ magnetic fields, meaning that approximately 97% of one pole is enhanced, while the other pole’s magnetic field is reduced to about 3%. The phenomenon is known as the “Halbach Array” (and even has its own Wikipedia page). A handful of companies have successfully applied Halbach’s permanent magnet arrays to enhance the power of their rotors. But their electromagnetic stators remained unchanged. Unlike permanent magnets, electromagnets cannot be oriented in a Halbach sequence because the copper wires create a physical and energized barrier that prevents magnetic forces from combining to form a near-monopole field. Catalan says he has overcome that physical hurdle and was recently awarded three U.S. patents along with several international patents currently pending for the electromagnetic version of a Halbach array and its various applications in motors and generators. Catalan says conventional motors are a bit like incandescent bulbs. Like photons from a light source, electric motors wastefully radiate magnetic energy in all directions. Catalan says his motor is configured to act like a laser, focusing nearly all the magnetic energy exclusively towards the airgap to enhance power and efficiency. By harnessing this ‘near-monopole’ energy, Catalan says an electric vehicle using a production version of his new motor would travel nearly twice as far as a conventional motor on the same set of batteries. Conversely, his motor in its final form would provide nearly twice as much power or torque as a conventional motor using exactly the same amount of energy. There are other advantages. Halbach arrays don’t require the additional metal (known as back-iron) that conventional motors need to function. As a result, ‘Catalan motors’ are lighter. Additionally, because the polarity of the patented electromagnetic array can be manipulated, both sides of his stator’s surfaces can be used. This opens up a multitude of potential applications. As the founder of a clean energy startup, Catalan knows that he has a long way to go. But as a parent and a family man, he says the stakes for future generations are high. Like many who have seen climate change documentaries from former Vice President Al Gore’s “Inconvenient Truth” or Leonardo DiCaprio’s “Before the Flood”, Catalan says failure is not an option. A growing number of countries around the world agree. Norway, India, Britain, France and China are moving quickly to phase out internal combustion engines. And Swedish automaker Volvo recently announced plans to phase out all conventional gasoline powered vehicles. Why? Catalan says it’s because the world deserves a better future. Asked whether his ‘near-monopole’ electric motor technology could become the new de facto standard for electric motors, Catalan replies with his Buddha-like grin, “If mankind is to overcome the threat of climate change, it has to.” Like the 15,000 signatories from the Union of Concerned Scientists recently proclaimed, the world as we know it is running short on time. In the race to save the planet, Catalan’s super-efficient electric motor could have the potential to buy us a little more time.